Whether you were catholic or non-catholic religion when you went to a Catholic school, you would have religiously memorised the Lord's Prayer not realising the original text has a difference! Or when you turn your Bible and read it in English still did not translate very well. Read further from my reference and let us be confused. Memorize prayer in a repetitive way is not the way to pray, we should pray or talk to our Heavenly Father from our hearts. Communicate whether in words or groaning in the spirit to our Almighty Abba Father Yahweh God intended us to, not a memorise one. Being religious does not guarantee you to heaven, we should try to live righteously not religiously is the correct way of saying it! 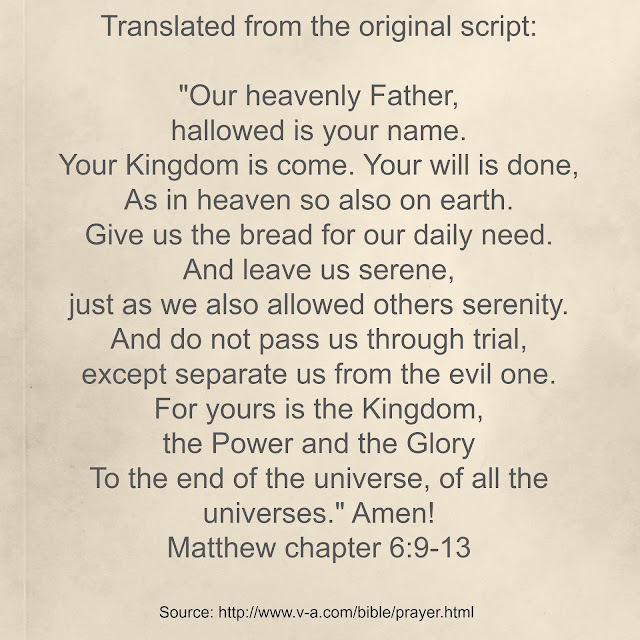 "... Our heavenly Father, hallowed is your name. To the end of the universe, of all the universes." Amen!